Lamb shanks were on specials a couple of weeks ago. So, I bought some back and decided to whip us a good dinner. A combination of some ingredients and greens added a new twist to this recipe. I combined lamb shanks recipe from BigOven and mash from Australian Women's Weekly CookBook (Winter Edition). I don't have a pressure cooker so I simmer it for an hour or so until the meat almost fall off bone. I plated it up nicely with any extra gravy served in another bowl alongside the shanks. It was really good. The balsamic is the secret ingredient that brings out the flavour of the gravy. It is stated in the recipe that if cooking Marsala were to be used, it is not advisable because cooking Marsala is loaded with salt. I've used the Marsala wine used to make Tiramisu in this recipe. The taste was special. You'll like it if you're one that dips french fries into sundaes. I hope you'll try it and plate it up nicely for you and your loved ones to try! This could be easily doubled and my shanks were really big. Clean and scrub the skin of the potatoes. Halve them and drop them in a clean pot of water and bring to boil. Lower heat to simmering point and simmer it for 20mins until flesh is easily pierced through with a fork. Turn off heat. Remove them into a large clean bowl. Remove a handful of spinach leaves and set it aside. Add all remaining baby spinach leaves into the pot of hot water. Put a heavy glass lid on and let it wilt for about 3 mins or so. Drain them and squeeze out as much water as possible from the leaves. Blend the leaves until almost smooth. Spread half the mash onto two clean plates and arrange the previously set aside leaves in a circular manner. Top up with remaining mash and spread them on evenly so the mash form some sorta circular disc. Throw them in the oven, on at just 50°C to keep warm while you get along to do the shanks. Trim excess fat (if any) from the shanks and give it a good shake of salt and pepper. Rub well to coat and brown them with the EVOO until they are evenly brown on all sides. Add in the bruised garlic and continue cooking until light brown. Be careful not to burn it. Combine in a jug the chicken broth, Marsala, dried rosemary, dried bay leaf and the tomato paste. Stir to dissolve the tomaoto paste. Add into the shanks and bring to boil. Lower heat to simmering point and cover on with heavy glass lid. Simmer it for an hour or more until meat almost falls off bone. Add in some chicken broth and wine if necessary if liquid is evaporating too quickly. 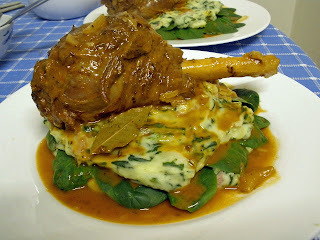 Remove shanks and place it on the bed of spinach mash. Set aside to keep warm. Turn on heat to high and boil for 5mins to thicken the gravy. When gravy appears thicker, whisk in the butter and balsamic vinegar. Pour the sauce over the shanks and serve immediately.